When picking out the right dress shirt for the occasion, the collar is one of the fundamental facets to take into consideration. However, with so many varieties in circulation, it can be hard finding the right one to wear. Furthermore, many manufacturers and retailers throw around a plethora of terms and names, which can be very confusing to both enthusiasts and newcomers alike. Therefore, finding the right style can be a challenge. 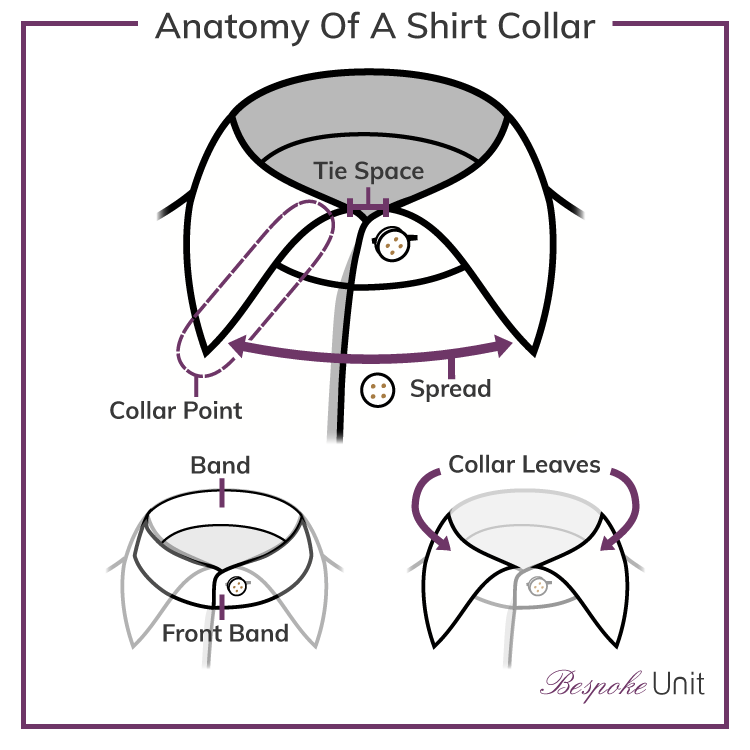 In the following guide, you will learn about the shirt collar’s anatomy as well as the various styles. Here, you’ll be able to confidently make sure that the shirt you choose if the perfect one for any occasion. See All Our Shirts Content! Though we men wear collared shirts quite often, we don’t tend to give them much thought. Why would we wear a button-down collar versus a spread collar? What does “spread” even refer to? And what are collar stays, and why are they important? This page will discuss shirt collars at length. We’ll cover subjects from different collar styles to the best occasions for wearing them. We’ll even touch on face shapes, which is a topic we often emphasise. For the uninitiated, we recommend that you learn to identify yours with our dedicated face shape guide. A fundemental guide. Knowing the right shirt to wear is essential for sartorial harmony! 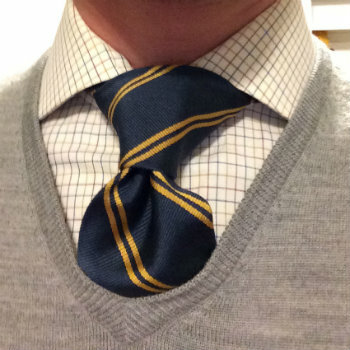 Shirt Collar Guide Reviewed by Charles-Philippe Bowles on January 24th . Collar Band: The part of the collar that makes contact with the neck; its bottom portion. Collar Point: Part of the collar leaf that surrounds the tie. Collar points are available in different lengths but are generally 2.75″-3.5″ long. Front Band: The front of the collar band. Tie Space: Distance between the top points of the collar leaves. You may be wondering, “Why is there differentiation made between a collar band and the front band?” The reason is that, in a custom clothing scenario, the client has the option of changing the height of these aspects of the collar. These decisions are made based on how long one’s neck is. If your neck is long, you’ll want a collar with a higher band to camouflage it a bit . If you have a shorter neck, you’ll want a shorter band so that your neck isn’t swallowed up in a shirt collar. Many dress shirts have little plastic or metal strips inside them, very close to the collar points. These are referred to as “collar stays,” and they help the collar “stay” in place without curling. Better shirts come with removable stays, whereas lower-quality shirts either have no stays or use stays that aren’t removable. If you flip your collar upside down, you may notice a pocket on the underside about 1/2″ wide. This is where a removable stay can be inserted or removed. Collar stays will make your appearance sharper, and we recommend ones made of metal, or at least thick plastic. Also, be sure to remove them before laundering or ironing! 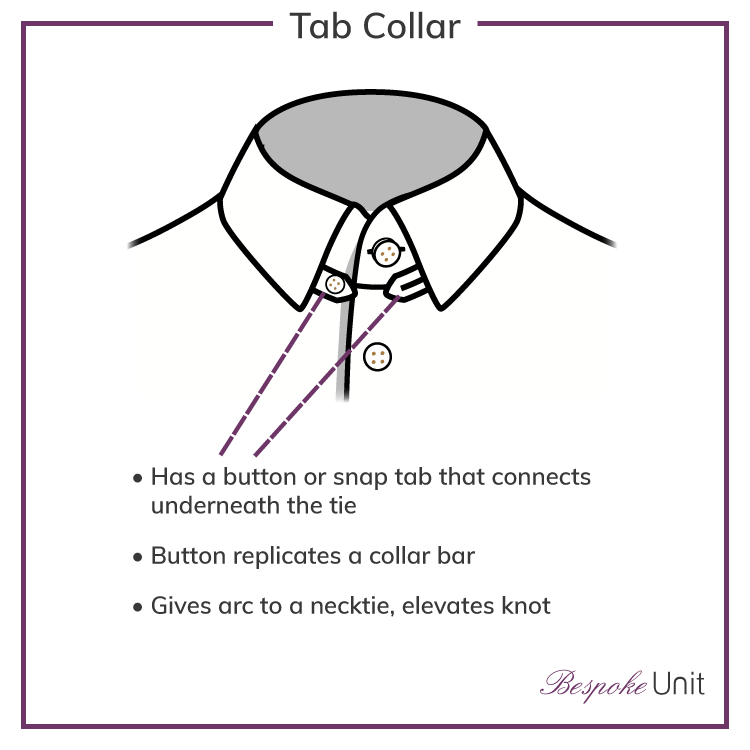 Note that button-down or pinned collars never take collar stays, as the buttons render them unnecessary. You can learn more about these in our dedicated collar stay guide. 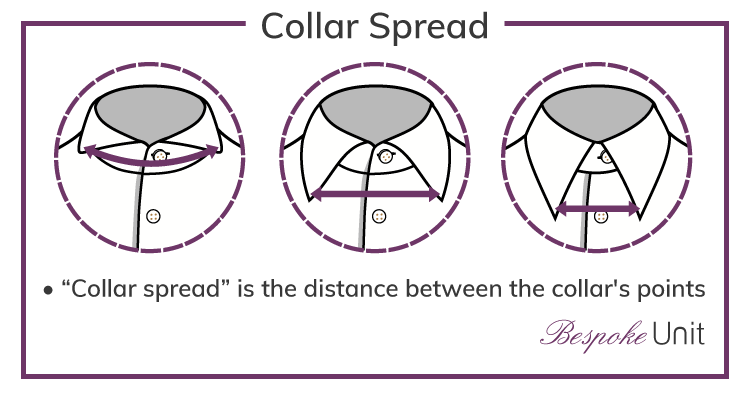 As we mentioned above, spread is the distance between a collar’s points. You will often hear the term “spread collar” when you’re shopping for shirts, and it tends to get misused as a term for any collar with a medium-to-wide spread. We even gave it its own category below! In actuality, collar spread is a continuum, and every collar in the world falls somewhere on that continuum. 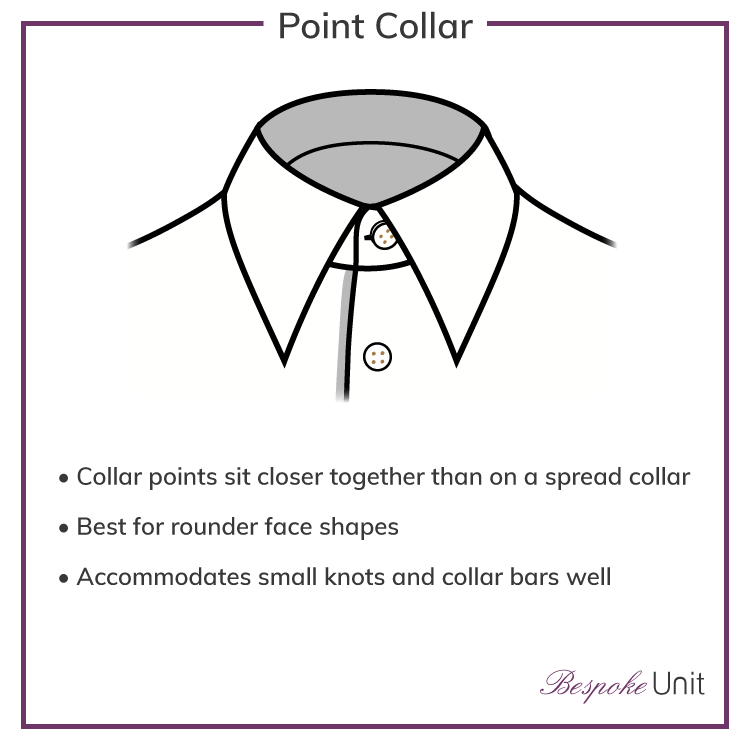 A point collar is just a spread collar with very little spread. A “Windsor” or cutaway collar is the opposite: a collar with so much spread that it forms a 180-degree angle. Below, we list the main collar styles we see for men. It’s good to own a few different styles to accommodate dressy and casual needs. The button-down collar is just what it sounds like: a shirt with a collar that “buttons down” to the shirt itself. Invented by Brooks Brothers in 1896 after John E. Brooks saw them on English polo players, these collars are soft and unlined. They were perfect for keeping collars out of polo players’ faces, and they were a hit with the Ivy League set upon their release. They’re considered to be casual shirts, even though many men wear them with suits. Having been invented by Brooks Brothers, they were incredibly popular with the Ivy League set for years. The key to a successful button-down collar is for it to have a “roll.” This requires longer-than-usual collar points, as shorter ones simply can’t offer the same elegance. 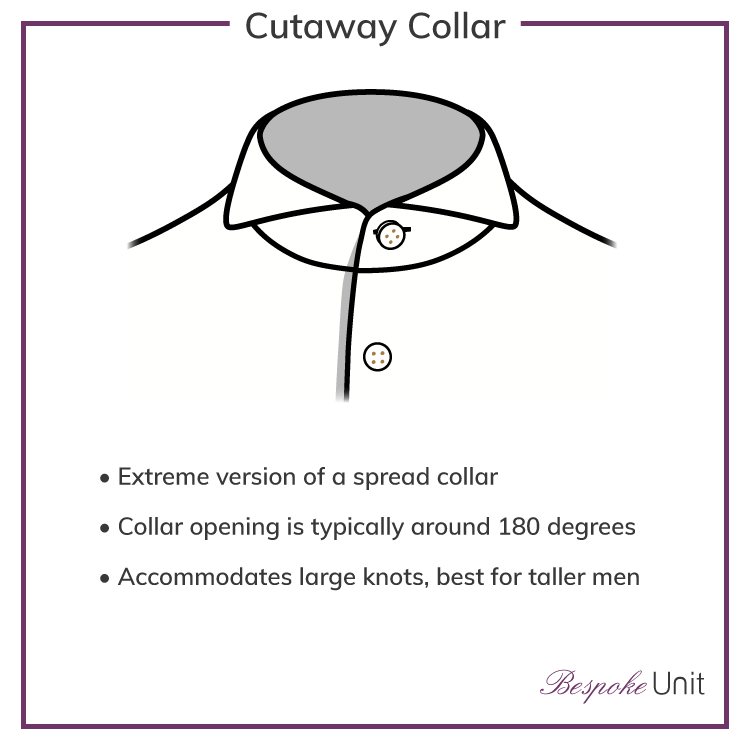 The cutaway collar (also known as the “extreme cutaway”) is typically in the realm of custom shirt makers and high-end menswear stores. An extreme version of the spread collar, the points open up to a 180-degree angle (sometimes more), thus accommodating the largest Windsor knot you can muster. For this reason, some retailers will refer to them as “Windsor” collars after the iconic knot. Cutaway collars tend to be favored by hyper-fashionable men. Club collars are short, rounded collars that are sometimes referred to as simply “rounded collars.” The term “club collar” is derived from the fact that shirts with this collar have been part of the Eton school uniform since the mid-nineteenth century. The collar has generally fallen out of favor in modern times, but it still shows up in the wardrobe of the more Vintage or Eccentric gentleman. These have recently been popularised by the BBC TV show Peaky Blinders and can usually be found as separate detachable or “stiff” collars. Theoretically, any collar can be a pinned collar. It’s not so much the collar that gives it its name, but rather the fact that you put a pin in it. The purpose of the pin is to elevate the tie knot, prevent it from showing collar behind it, and giving your ensemble an overall regal look. Years ago, men would take a safety pin (often made of gold or silver) and simply poke holes in their collars. When these shirts are sold nowadays, they come with pre-made holes in the collars for this express purpose. There are also all manner of collar bars that fit neatly into these holes, which opens up a man’s options for a bit of bling. This is, sadly, another look that has fallen out of favor in recent decades. Some men consider it fussy, others are frankly a bit intimidated. This was a huge trend in the 1930’s, which happens to be one of the Golden Ages of men’s style. As mentioned above, the most comptable shirts for this style feature pre-made eyelets. Nevertheless, you can learn more about these in our detailed collar bar guide. The point collar is one that has relatively little spread. One of the most common collars, it’s often seen in cheap versions with puny points. It has a department store kind of connotation insofar as it feels like it isn’t special. This is unfortunate. While it’s true that the point collar is indeed ubiquitous, it has its place in the menswear canon, especially for those with rounder faces (more on that below). That said, point collars with a very narrow spread were popularised by Scorsese films such as Goodfellas. Known as the “Spearpoint”, these collars are hard to come by and feature a particularly iconic look. The spread collar is the most ubiquitous collar in menswear today. We say this because so many different styles of collar fall under the “spread” umbrella. It ranges from semi-spread to the extreme cutaway mentioned above. Its versatility allows it to pair with many different sized tie knots, and it looks equally good with neckties as it does bow ties. Furthermore, its versatility makes it look good on nearly any face shape. There’s a reason for its popularity. The tab collar is what happened when men realized they liked what a pinned collar did to their ties but didn’t want to deal with the pin itself. Tab collars have -you guessed it- tabs that fasten to each other underneath the tie knot. Typically, this is achieved via either a snap or a small button and buttonhole. This serves to keep the tie up and minimize any visible collar behind its knot. Shirts with tab collars were quite popular in the 1920’s and 1930’s, and had a brief resurgence in the 1960s. Nowadays, they’re relatively rare and are typically only found in men’s custom shops. 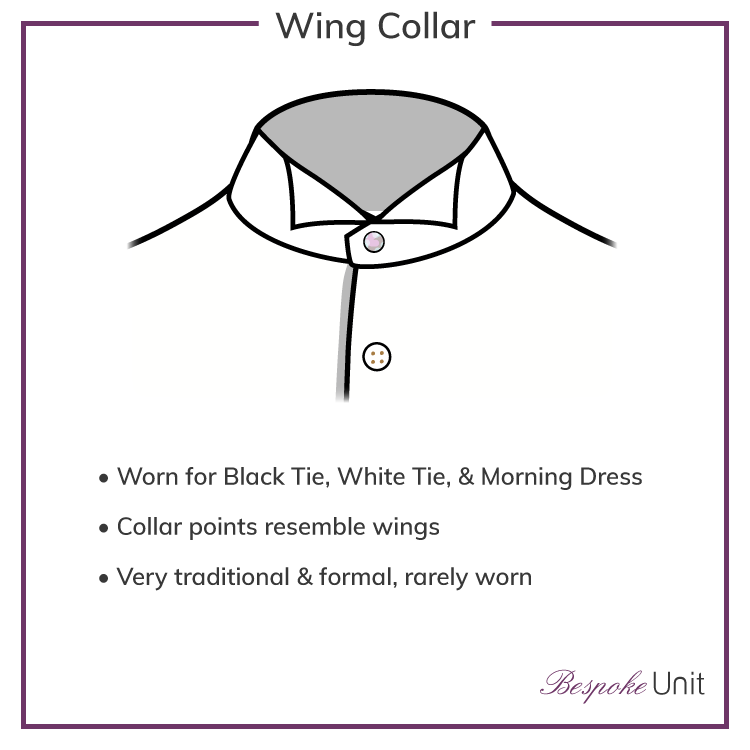 The wing collar is the most formal of all the collar styles. Its name is derived from the fact that its points stick upwards and outwards and form small wing shapes. The only time to wear it with a morning coat is if the coat is black, as the wing collar is considered too formal for a grey coat. Nowadays, a spread collar is far more common than the wing. Wing collars for morning dress still take neckties, but they take bow ties for black and white tie. A wing-collar shirt with a tuxedo is a classic look. Its sharp lines pair especially well with those of a peak lapel dinner jacket. The other option is, again, a turndown spread collar. These pair equally well with peak lapel or shawl collar dinner jackets. Finally, a wing collar is a requirement with white tie, period. It is extremely important that the bow tie rest in front of the wing collar’s wings. This helps to keep the bow tie in place and also prevents the ensemble from looking limp from the neck up. While there’s value in having a varied, versatile wardrobe, dressing to one’s body type is hugely important. In the context of shirts, the collar’s interaction with your face shape is paramount, and a wise dresser stocks his closet with shirts that have collars that harmonize with his face’s shape. If you’re unsure of your face shape, we highly recommend that you use our face shape identifying tool. You’ll learn your face shape in less than five minutes! We chose the word harmonizes above carefully. A shirt’s collar should support your face’s strengths and strengthen its weaknesses. Generally speaking, round faces do well with point collars, while longer, more angular faces do well with spread collars. While collar selection should be based on your face shape first and foremost, it’s also important to keep your occasion in mind. Below, we list some of the most common events for which a man should think about his shirt’s collar. Most weddings require a man to wear a suit or a tuxedo. This is the case regardless of whether you’re a groom, groomsman, best man, father of the bride, or a guest. With that in mind, spread collars work best in either scenario, but if the invitation indicates semi-formal attire and you wear a tuxedo, a wing collar is also an option. With that said, guests have a bit more leeway than those directly involved in the wedding. If you’re an eccentric guest, perhaps a pinned or club collar would go well with your suit. Alternatively, if the wedding is very casual, a button-down collar with a blazer and casual trousers will do. For a complete guide to what to wear to a wedding regardless of your role (or lack thereof), see our wedding home page. As you can see from the graphic above, tuxedos call for one of two types of collars: either spread (also referred to as “turndown,” as in it “turns down” unlike the wing collar) or wing. In this instance, spread collars require a pleated bib front, whereas wing collared shirts require no such front. Note that tuxedo shirts must take French cuffs. For more information, see our guide to black tie. Casual occasions are by definition more lax than formal ones. As such, you have more leeway in your collar choice and should leave the decision up to your face shape and personal taste. Objectively, button-down collars are quite casual, as are point collars when unbuttoned. For casual occasions, you should avoid wing collars and cutaway collars. Companies’ sartorial cultures vary widely. Some more traditional firms will have a more strict business professional dress code, whereas others are business casual and less stuffy about it. 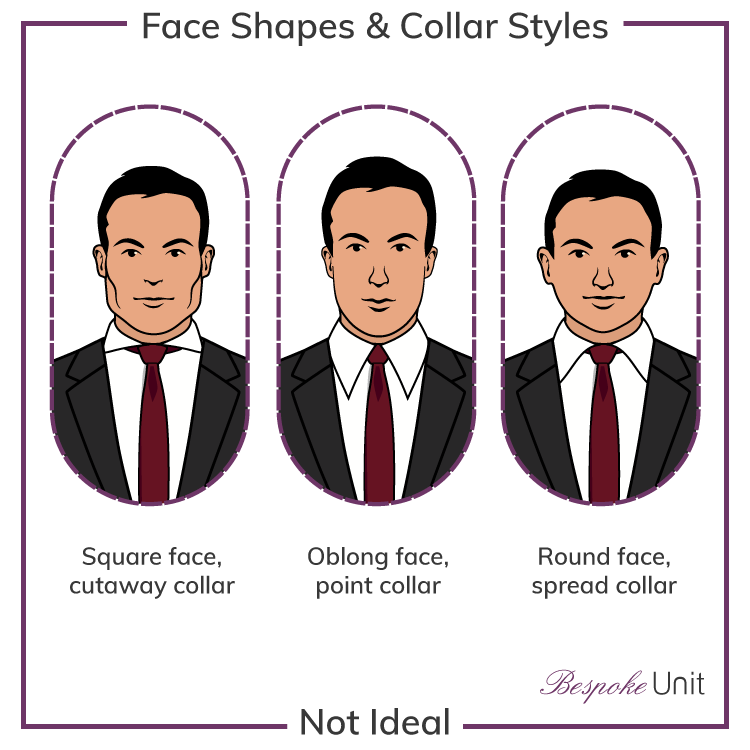 Men in more conservative offices should opt for a spread collar, the degree of which should be determined by your face shape. If your firm does Casual Friday, you may lose the tie or opt for a button-down collar. More casual firms mean that the rules are more lax and you can probably get away with a button-down collar all week. Regardless, it’s best to avoid highly stylized collars such as Pinned, Club, or Cutaway at work unless you work for a clothing retailer or are so high up at your company that no one can say anything to you about it. Certain collars tend to pair better with certain neckwear styles. Below, we list some of the most common neckwear options and the best collars to pair with them. When pairing collars to neckties, the important thing to consider is the tie knot you’ll use in relation to the amount of tie space and spread the collar has (if you need a primer on a few tie knots, our guide on how to tie a tie is very helpful). 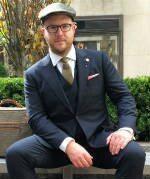 Smaller knots such as a 4-in-hand or Oriental pair well with point collars and club collars, and actually look good in medium spread collars too. A thicker knot such as a Windsor will look great in a spread or cutaway but will overwhelm a point collar. For casual occasions, wearing a necktie with a button-down collar can work well. Because their knots are small and unobtrusive, bow ties can be worn with any collar except Pinned or Tab. Skinny ties (those which are 2.75″ wide or narrower) pair best with collars that have a small amount of tie space and should thus be treated like ties tied with smaller knots. If we take ascot to mean “neckerchief,” then we’re talking about a scarf-like accessory that actually lives underneath the shirt collar. As such, a Spread, Point, or Button-down collar will be best, and your personal preference can take precedence here. Cravats such as “scrunch ties” or a rouche are typically worn with wing collars, though we generally don’t recommend this look. For more, see our guides to ascots and cravats. 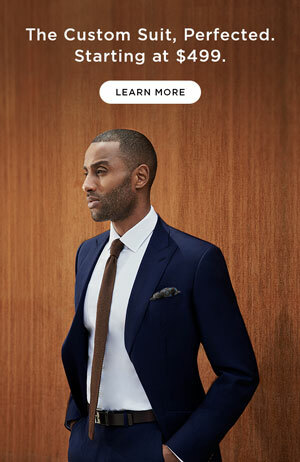 Generally, a Spread collar is your best bet with a suit. If you’re attending an evening occasion or are a bit more of an eccentric guy, a Club or Pinned Collar also work with suits. A Tab collar is a fine option for those of us who want our ties to have some arc but wish to forgo the collar bar. The most important thing for your shirt collar as it relates to your suit is that the end of the collar points should ideally be covered up by the jacket’s lapels. This isn’t a hard-and-fast rule (pinned collars, for example, are typically worn with suits but the points are 100% visible between the lapels), but you should try to follow it as often as possible. A classic weekend and business casual look is a collared shirt underneath a sweater. We find that Spread and Button-down collars tend to work best, and you can even put a tie on with this ensemble if you so choose. Knowing about how shirt collars work and how to best pair them with your face shape is incredibly important, and we hope that you now have the knowledge to speak about it and make yourself look your absolute best. For more of the nitty-gritty on shirts, we invite you to take a look at our guides to cuffs, collar stays, and our shirts home page.